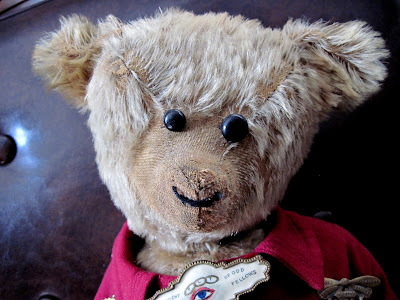 I've posted once before about this bear, shortly after I found him, but he's had a lot of work done since then and I thought he was worth another look. One of the favorites from my collection, this large, 20 inch British bear dates from around 1915, and came wearing an antique child's coat of cranberry colored wool. 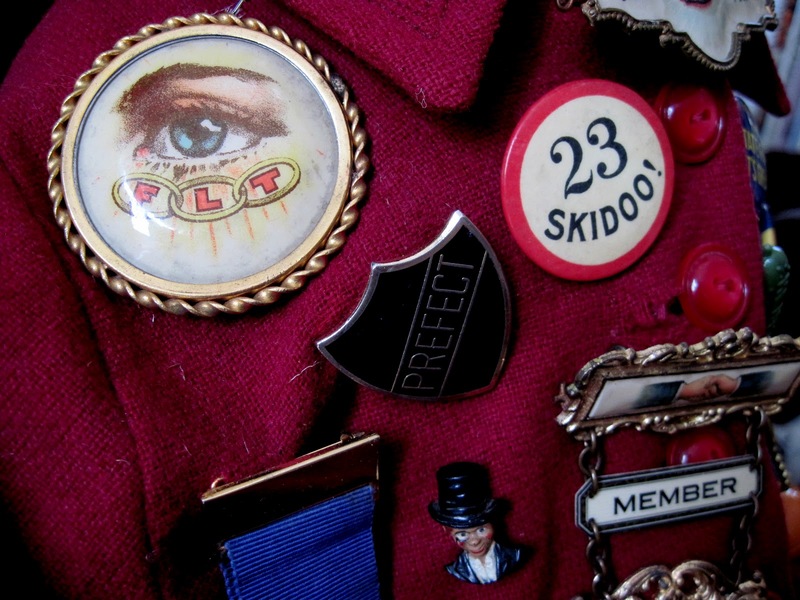 His original owner had added a few school pins to the coat, including a prefect's badge and what might have been a track and field medal. 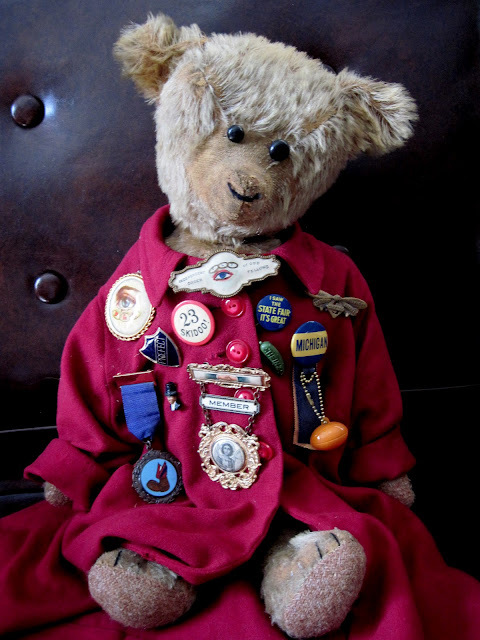 I added an old Oddfellows pin, given that the bear has a rather odd, yet endearing, appearance. At some point in his long life, he experienced eye replacement surgery, and apparently his doctor was all out of matching shoe buttons. 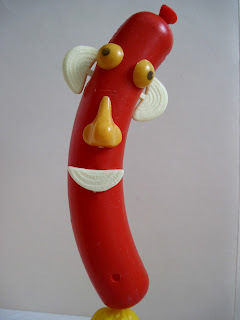 I wouldn't change it though: the mismatched eyes give him great character. 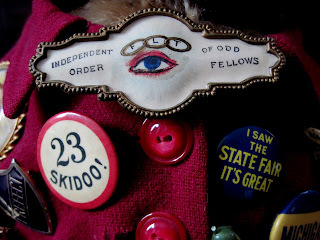 Some of my favorites are in this closeup: another Oddfellows badge, a "23 Skidoo!" 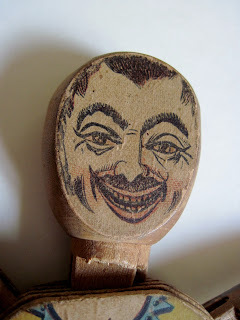 pinback from the 1920s, and a teeny tiny Charlie McCarthy. 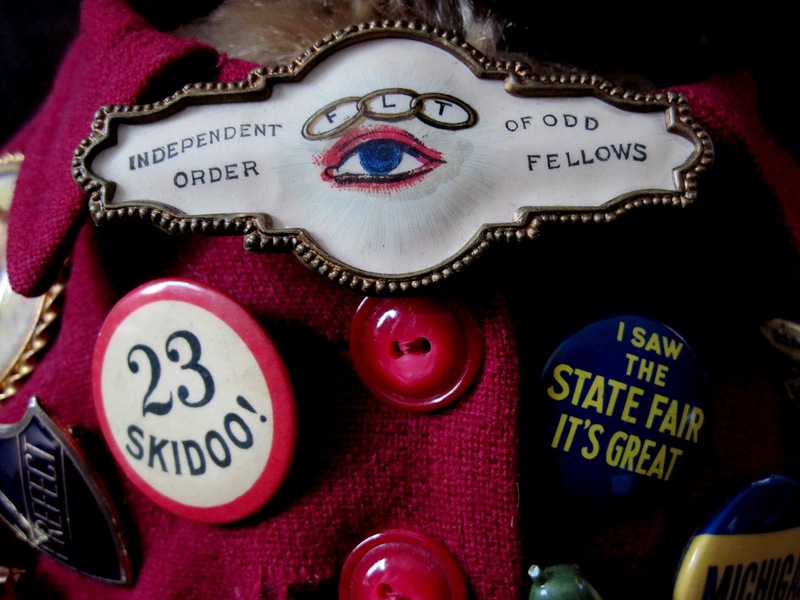 The large Oddfellows badge below dates to the early 1900s. Vintage pins, including a University of Michigan football badge, an old State Fair souvenir, and a Heinz Pickles advertising pin adorn the left side of the coat. 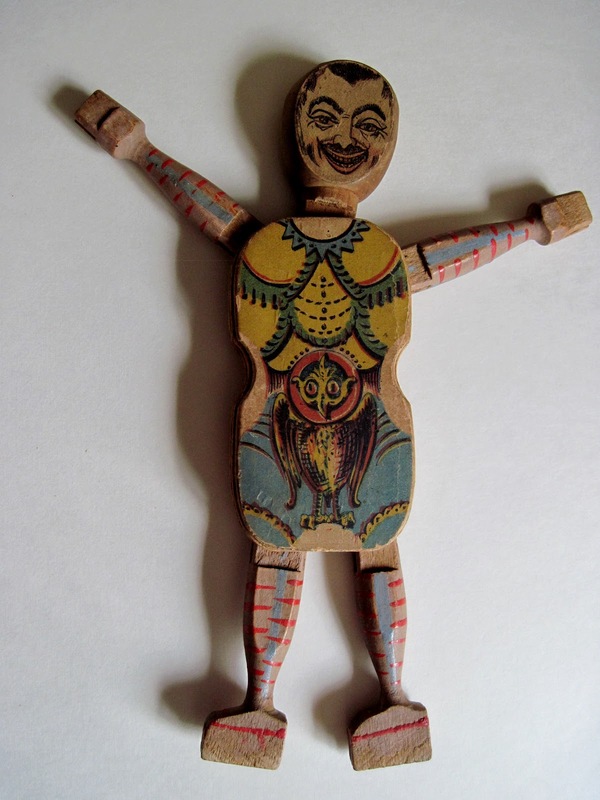 My birthday last month was one of my happiest ever: I receieved an antique toy that had long been on my "It's Hopeless" wish list, as I had only ever seen it in museums or an occasional high-end auction. 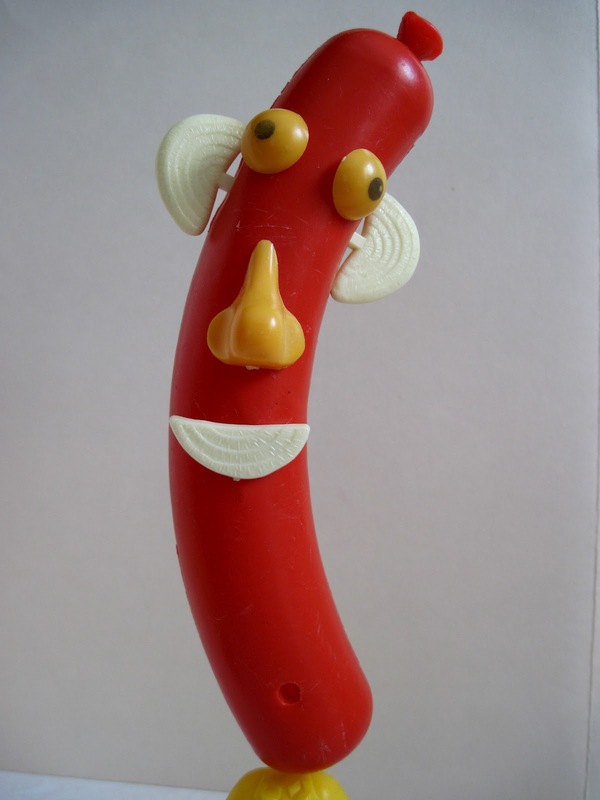 But then, just a couple of weeks before the big event, we found one from an online toy dealer, and at a reasonable price. The toy is now one of the oldest in my collection, and, I think, one of the most beautiful. 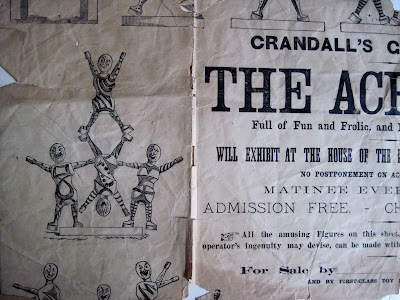 Patented in 1867 and made throughout the 1870s, Crandall's Acrobats were created by Charles M. Crandall, born in 1833. 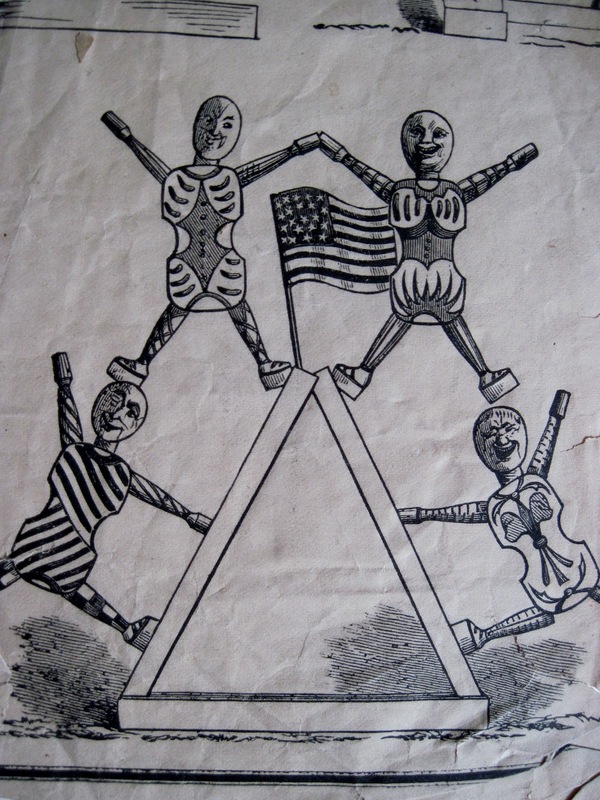 His business was first located in Covington, Pennsylvania, and later moved to Waverly, New York. 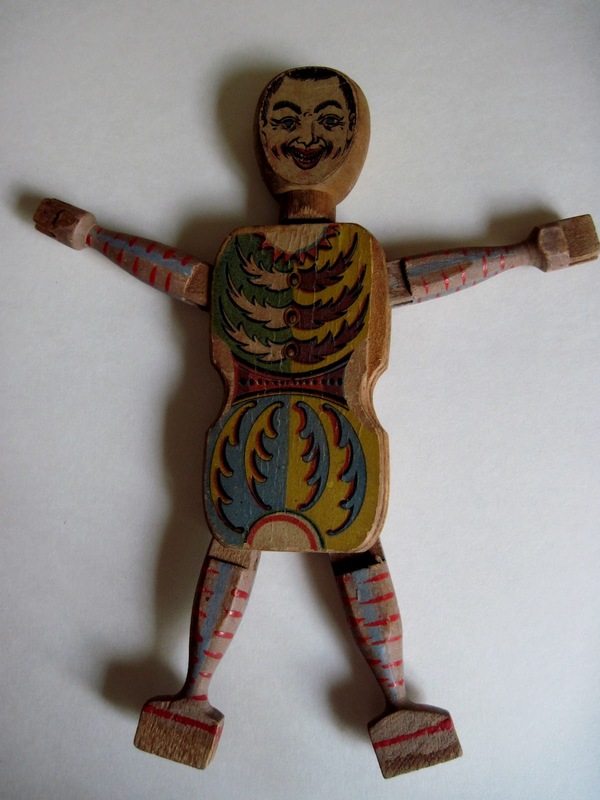 He became one of the preeminent American toymakers of the 19th century, specializing in wooden toys, and is now famed for his building blocks, jointed figures, and puzzles. Full of Fun and Frolic, and Most Brilliant in Costume. Will exhibit at the house of the purchaser Afternoon and Evening. NO POSTPONEMENT ON ACCOUNT OF WEATHER. 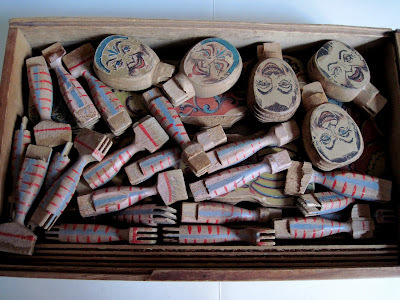 Inside the box are pieces to make five acrobat figures, comprised of separate torsos, heads, legs and arms. The legs and arms feature hand painted details, while the torsos and heads have beautifully lithographed paper designs, all different, printed on each side of the figure, which doubles the number of combinations possible. 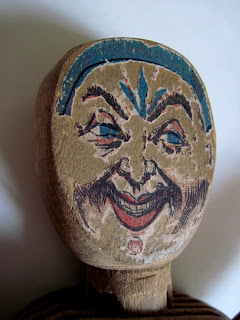 Yes, clowns are scary...this one especially so. 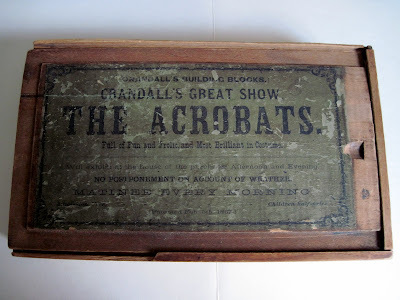 The Acrobats feature one of Crandall's most innovative designs: the pieces have slotted sides that allow them to be connected in a dove-tail fashion. 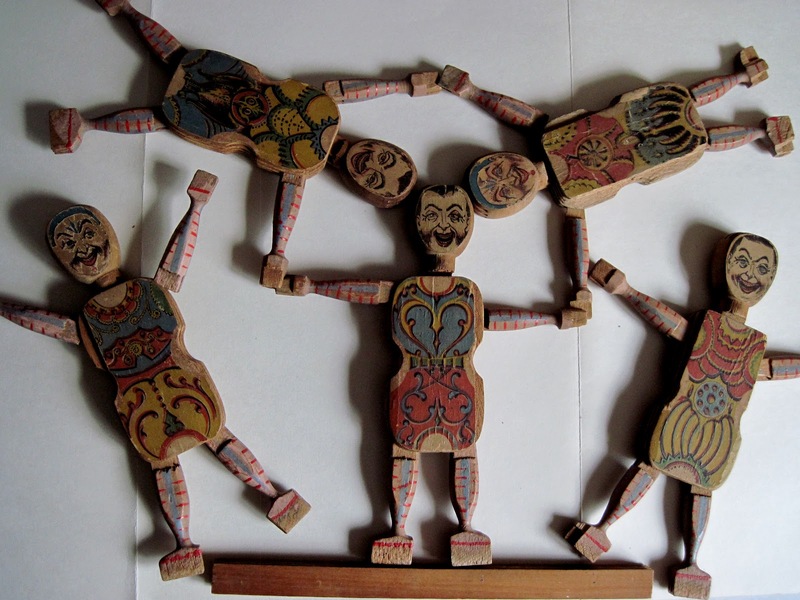 This enabled children to assemble the figures in a variety of combinations. 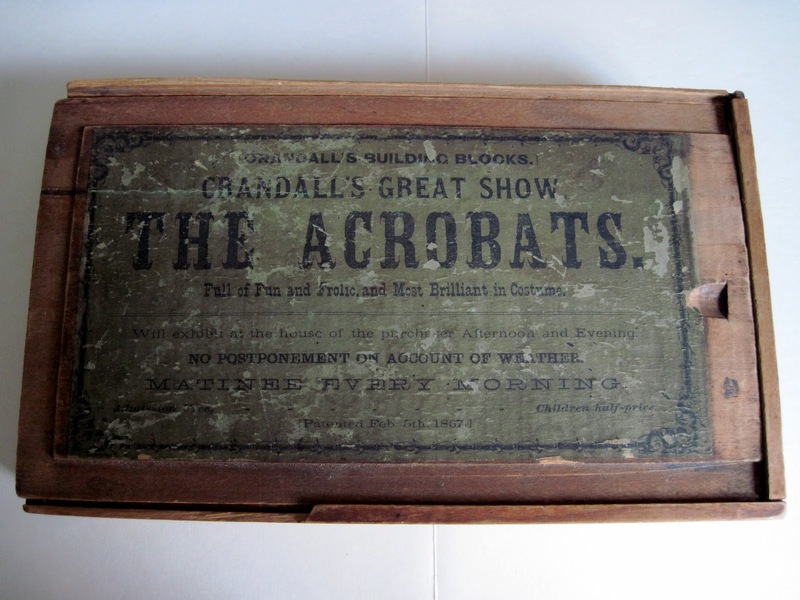 The set also came with several slotted bases, into which the acrobats could be inserted. 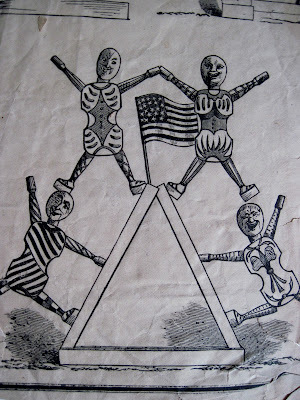 Then children could use the enclosed booklet or their own creativity to build acrobatic pyramids. My set still retained remnants of its original booklet, now in an incredibly fragile state. I'm off to hold my first matinee, "admission free and children half-price." 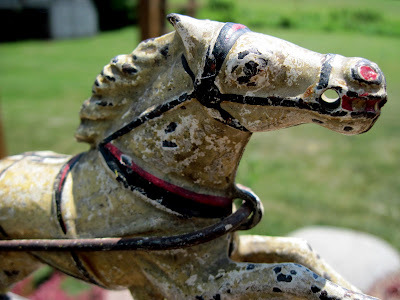 Last year, I evaluated a collection of antique cast iron toys for a friend who was ready to start selling. 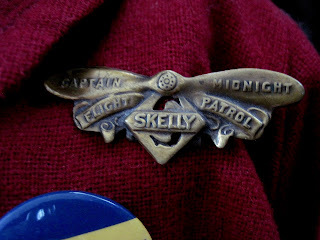 She had a lot of fire engines, ranging from some very beautiful 1800s era horse drawn engines all the way to chubby, cheery red 1950s trucks. One of my favorite items in her collection was just a piece left over from a long-gone larger set, and I was able to rescue it and bring it home. This cast iron horse came from a very large fire engine: the horse itself is 7 inches long. The engine would have been an expensive one back in the 1870s-80s, and was probably pulled by two or three of these horses. This one, while its original paint is worn, is still quite beautiful; the complete toy must have been just absolutely gorgeous. A really clever feature is visible if you look closely at the wheel below the horse's front legs: the axle is offset, not centered. 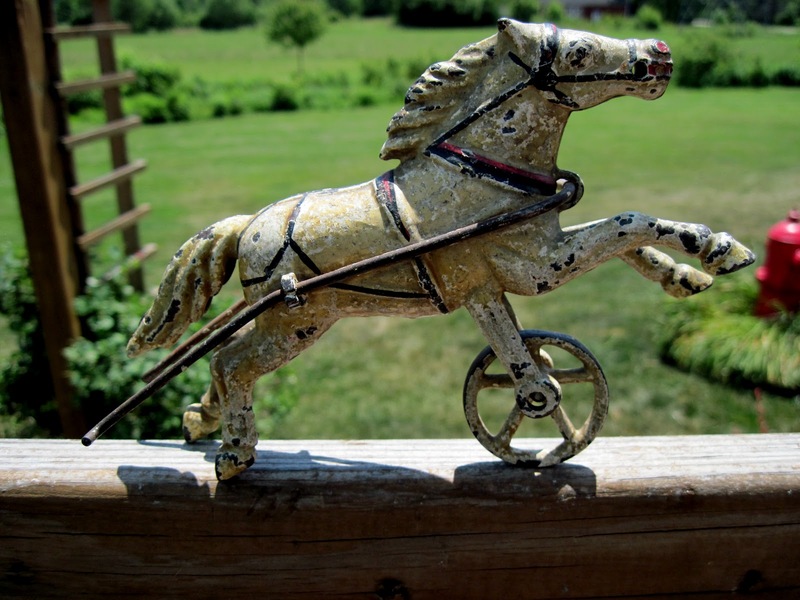 When you roll the horse along a flat surface, this offset axle makes him move up and down, imitating the motion of a real galloping horse. 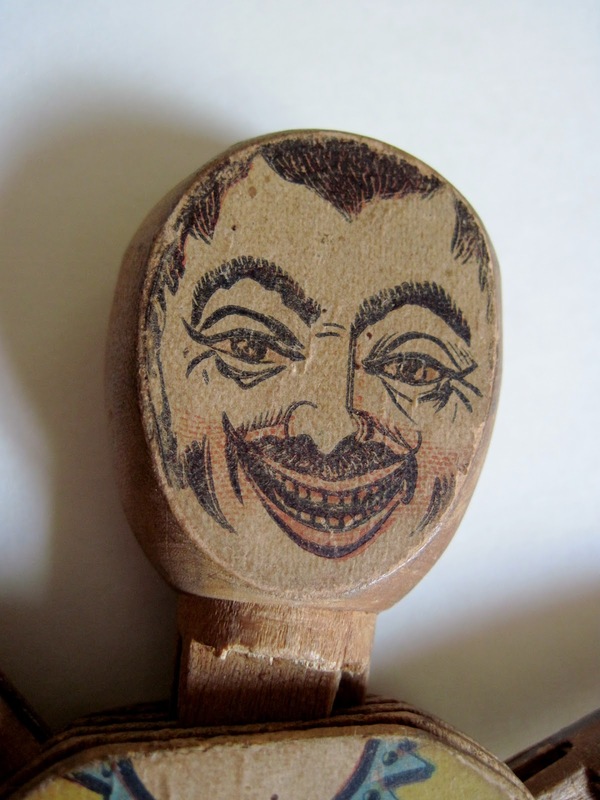 In this closeup of his head, you can see the lovely patina the original paint has acquired. All the details of the harness and face were handpainted. I wonder where this toy horse has been, and what he's seen, in his 140 years. 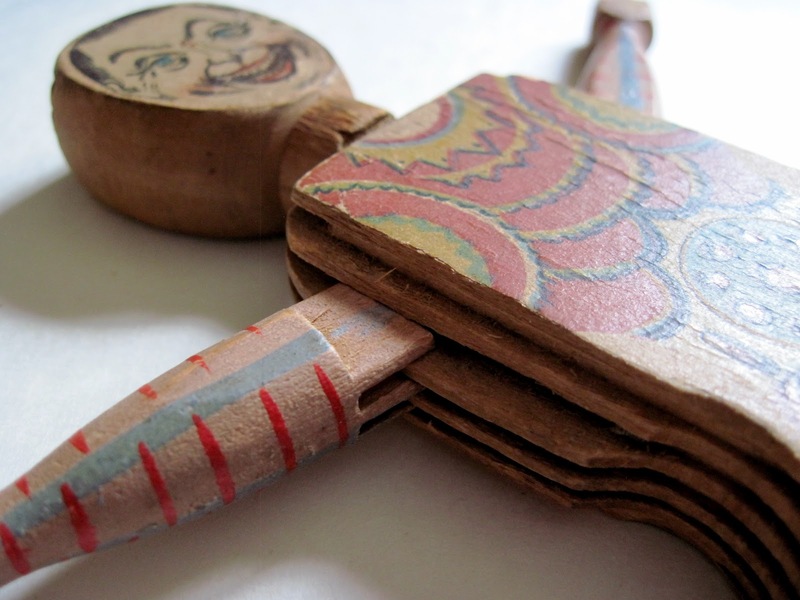 I'm happy he was saved from the scrap heap, that fate of most broken things. He's now comfortably enjoying his well-earned retirement at Tracy's Home for Orphaned Toys. 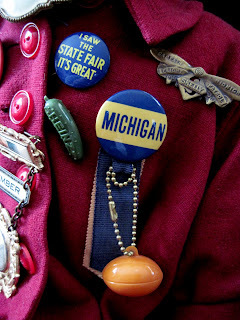 We're just about to head out for our Fourth of July picnic, so it's the perfect time to post one of my favorite vintage Mr. 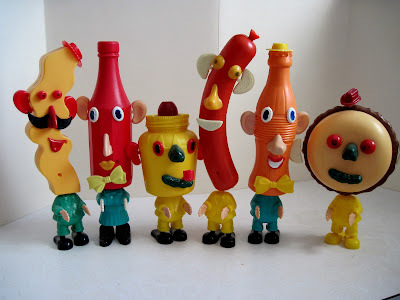 Potato Head sets: his friends the Picnic Pals, created in 1966. 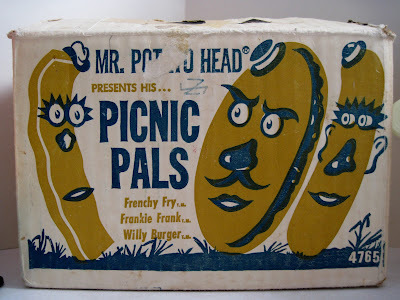 The Picnic Pals were some of the most unusual items ever released in the Potato Head line. 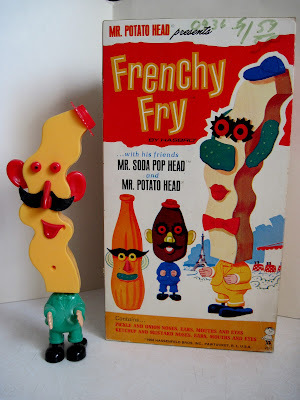 There were 6 characters, all featuring plastic heads with separate bodies: Frenchy Fry, Mr. Ketchup Head, Frankie Frank, Mr. Mustard Head, Willy Burger, and, to wash it all down, Mr. Soda Pop Head. Frankie Frank, Mr. Soda Pop Head, and Willy Burger. The Picnic Pals came with specialized accessory pieces made just for them: onion slice ears, pickle noses, and eyes the color of ketchup or mustard. The Pals were sold in two ways: the first was the rare complete set box, shown below, which contained all the characters plus their original Potato friend. 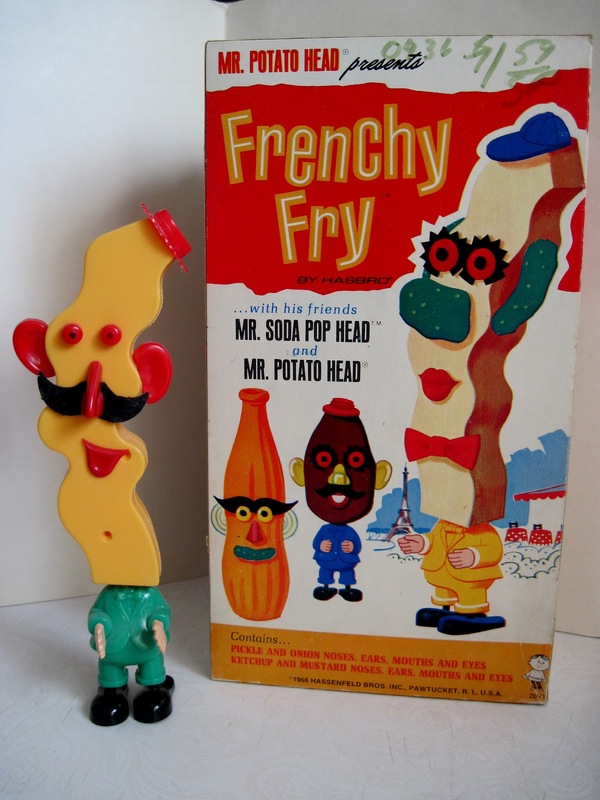 appear to threaten a trembling Frenchy Fry in this box art. Not sure what that's all about. The second variation was a tall, slim box with colorful art work, which included one main character, a condiment or beverage buddy, and a Mr. Potato Head. 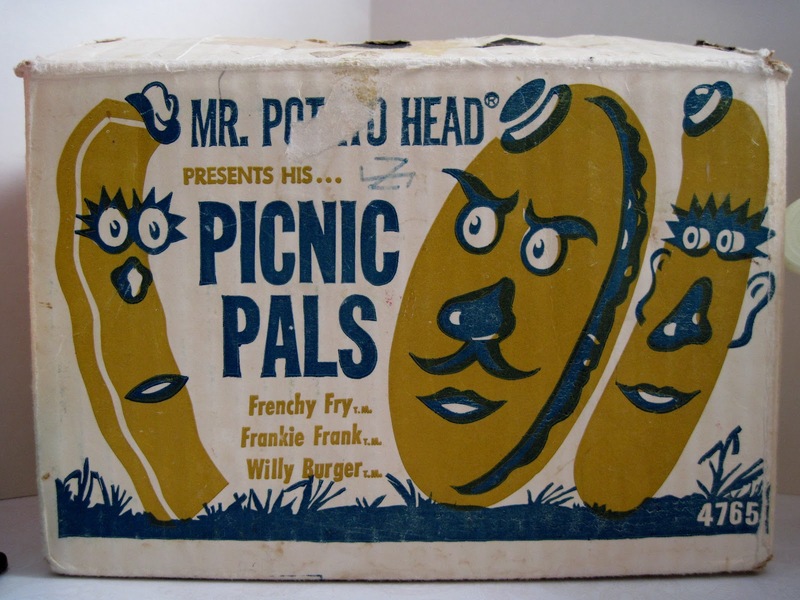 For some unknown reason, Willy Burger is the hardest to find of the Picnic Pals, although they are all much more scarce than the regular Potato Heads. We're off to our picnic to eat some of these. Hopefully ours won't be staring at us.